1. 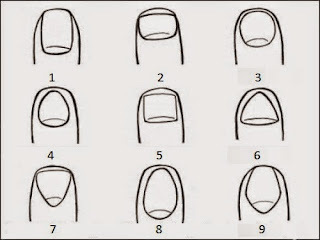 The vertically long nail. You’re probably a real romantic. Even-tempered with a strange but wonderful imagination. You can be a perfectionist and easily overwhelmed. You see the little things that few notice. People really love you. You get along with most people. Unlike #1, you’re more short tempered. You are, however, a sharp, deep thinker. Even though you’re short tempered, people enjoy you for your straightforwardness. You can tell the difference between the truth and lies. That ability allows you to cut through the BS and offer the best advice. You don’t tell people what they want to hear, you tell them what they need to hear. 3 and 4. The “round-egg” nail. You’re the endlessly happy one. You’re the pacifist. You’re the laid-back one. You enjoy doing things in a very unique way. You rarely go with the what the majority is doing. Even though you’re in touch with your feelings, you don’t often let them get the better of you. You’re the gutsy one. You’re the one born a natural leader. You have a serious attitude that can put people off, but that makes your playful, good-natured moments all the more pleasant and fun for everyone around you. 6 & 7. The Triangular nail. You’re the smart ones of the bunch. You’re typically innovative and brilliant when others demand perfection out of you. You often bring new ideas faster than most. People you meet are fascinated by you. You’re honest, friendly, and faithful. You’re polite but firm when it’s needed. People enjoy spending time with you because you find the good in them. You’re good at handling difficult situations. Last but not least, the sword nail. In your life, you’re often the tip of the sword. You’re ambitious. You work hard. You have your goals and you won’t stop until you meet them. You’re often well rounded and can handle tasks even far outside of your comfort zone. Your ambition is often contagious.